It was by pure chance I saw this praying mantis mommy laying her eggs in our front doorway! I was on my way out to water the garden and I glanced down. Gee! I nearly stepped on her. She looked up at me and must have called out – “Watch out!” Had I not been mindful, I would have not gone down on my knees to take a closer look. What a magic sight! Have you ever seen this before? Its like a foamy sponge that goes hard. The eggs must be inside! 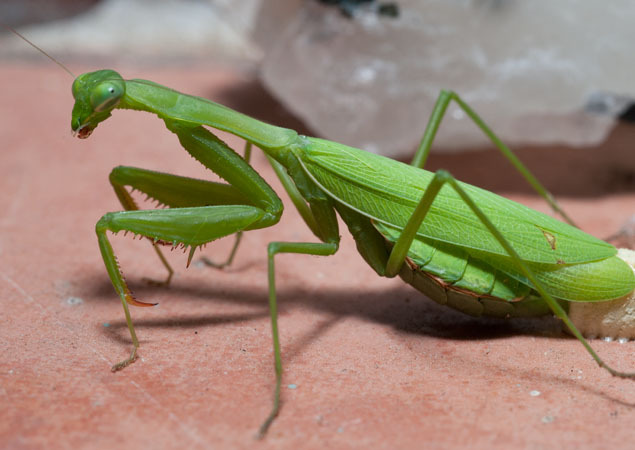 I remember when we first moved to this house, we had a praying mantis and watched her laying her egg sac on a pot plant. My hubby fed her flies and she ate until she nearly popped! We monitored the egg sac and then one day, out popped baby mantises! WOW! What a sight to behold! I’ll have to keep you posted on this hatch! Today is day one … and counting! Oh, my goodness!!! I just read your other post about the babies hatching. This is just AMAZING!! I am blown away that you actually caught her laying the sac!!! I would be doing backflips if I witnessed this and/or the babies hatching. Thank you so much for sharing this amazing wonder of God’s creation!!!! I find egg sacs every year in my garden but have never had the privilege of witnessing either laying or hatching. Amazing photo. I love how she’s kind of glaring at you. Hoping for many healthy babies for your garden! I’ve never been lucky enough to see those eggs being laid. How wonderful that you noticed it and could take those terrific pictures. She certainly picked an interesting spot. I sure would love to see them hatch! Wow! This is interesting. I have the eggs in my garden but have yet to see the process you just documented. I have Never, Never seen this!! I have a friend that Found an egg case once. She gave it to me, and our second grade classroom Raised the babies in the Spring. However, they hatched too early (probably because I kept it indoors) to be let outdoors . . . and many of them ate the others. boo. How many days I wonder? When they hatch inside, I end up coaxing nearly invisible babies onto a bitty paper and out into the big wide world. It is a wonder that any of them ever survive! 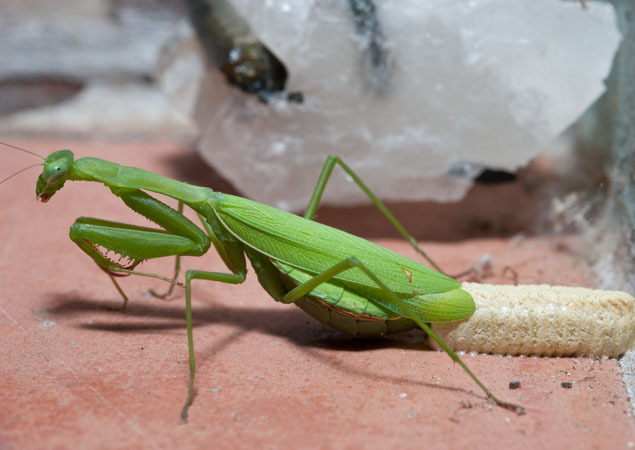 My first time to see a mantis laying eggs, very interesting post! Thanks for sharing! Wow, that is wonderful! And how great that you’re able to take such great pictures and share them with your followers. Thanks, I’ve never seen this before. What a fascinating sight! How awesome. Thanks for sharing! Looking forward to seeing them develop and the new babies hatch! Very cool capture. You are really observant. That’s amazing. Of course I have seen the insect and the egg cases but never in the act. Barbie’s Birth Center!!! Heehee!! Yup – Nurse Barbie will be delivering the babies! what a wonderful thing to witness. thanks for sharing that and i look forward to the updates. I have never seen this! And if I saw an egg sac, I would not know what it was – thanks for showing us these pictures. I hope you can get pics of the babies emerging – that would be incredible! Oh my! That is waaay cool! I’ve seen them before but never with the mamma delivering. Sweet! Can’t wait to see the little ones! Will keep you in the loop! It is amazing watching them hatch. Oh my goodness, I’ve found these things lying around before but never knew what they were!! How amazing! Very cool, hey? The fun part is watching them hatch!! Hope I can capture this on camera. Barbara — after the egg case has completely hardened (a week? 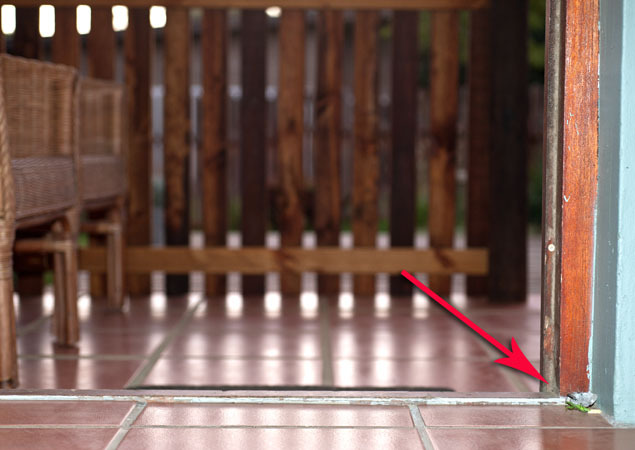 ), you can probably pop it off the floor and move it somewhere more protected and easier to monitor — like a jar. I’ve done this with mantis cases that were attached to wood outdoors, so getting it off the smooth tile should be easy. Here though the eggs are laid in the fall, overwinter, then hatch in the spring. Thanks Alan for the tip – I will do this, so I can keep my eye on it. I have lost all my praying mantises when I pulled out my lavender bushes. I would love to populate my garden again with baby mantises! AND, I can keep a photo journal on the process.